Seoul (Korea). Host Korea got a satisfying ending to the XXV IBAF 18U Baseball World Championship. They shut out Japan 3-0 on Saturday morning at Mokdong Stadium in Seoul to finish in fifth place in the final standings. Three pitchers combined to allow just four Japanese hits en route to the victory. The offense was led by Dae Young Yoon, who highlighted the game with a solo homerun in the ninth. Japan gave the starting nod to Shohei Otani (7 IP, 2 H, 2 R, 4 BB). The hard-throwing right-hander reached 96 MPH (155 KPH) on the radar gun and struck out 12 batters in seven innings. However Korea still managed to score against him. 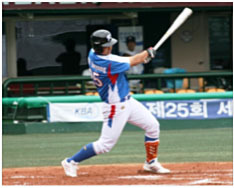 In the second inning Jun Suk Song gave the host a 1-0 lead with a RBI double. In the fifth he personally scored the second run on a balk call. In the ninth Dae Young Yoon connected off reliever Takuya Sato with a solo homerun into the seats down the left field line, sealing the 3-0 win. While Otani put up the spectacular numbers on the radar gun, Korea’s starting pitcher won the game. He allowed just three hits and three walks in eight scoreless innings. He struck out seven and shut down the Japanese bats throughout the game. Jae Min Shim and Hyoung Bae Yoon closed out the shutout by pitching around two base runners.